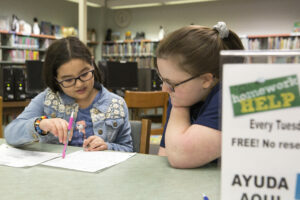 For all K-12 students, Elkhart Public Library provides a space for after-school tutoring. Throughout the school year, National Honor Society students from area high schools will be available to help any student with their homework, no matter the subject. Tutors are not unlimited, so it is a first come, first served basis. Each location will host a night of Homework Help each week. Students interested in coming to Homework Help should bring their assignments, as well as the materials and supplies needed to complete projects. They will get help from qualified and knowledgeable National Honor Society students, and they also get to create a bond with a good role model from the community. But things are different this time around, and Homework Help is more of a supplement to the programs offered at schools. Pieri is hopeful this program will serve students well. While students are here for Homework Help, they will also get the chance to check out more of Elkhart Public Library’s resources. Homework Help runs through Memorial Day.